Pleasant citrus taste. 2 oz. 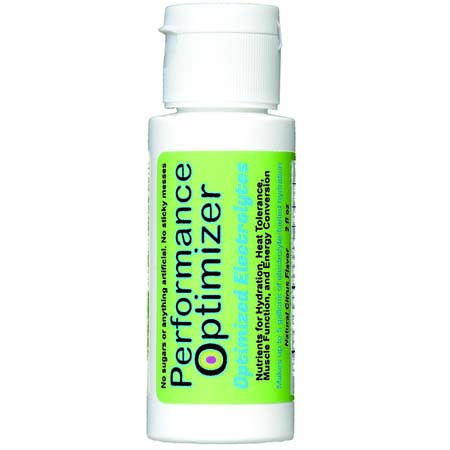 Performance Optimizer Electrolytes™ concentrate makes 20, 32 oz. /1 liter servings, or 5 gallons of refreshing sports electrolyte drink. Nothing Artificial. No Sugar. No Sticky Mess. Contains bio-energetic nutrients with a delicious hint of lemon. Drink Performance Optimizer™ Electrolytes for optimized hydration, improved heat tolerance, boosted muscle function, and turbo-charged energy conversion. Optimizes your body's natural strength, physical balance and helps its ability to assimiliate oxygen. Focuses your mind and helps improve performance under strenuous physical, mental, and psychological conditions. Helps create power and stability for increased stamina and quicker recovery. Nothing Artificial. No Sugar. No Sticky Mess. Simply mix with water for a crystal-clear energy drink with refreshing lemon and no after-taste. Energy Tools International™ athletic performance products are all-natural and charged with bio-energy. No additives, no sugar, no preservatives. Feel good about getting in good shape! Get yours today!